Jardines de Apoyo is an extremely poor community located 25 minutes from Managua, the capital city of Nicaragua. Most of the residents were relocated to the village after a landslide had destroyed their homes. Parents work long hours for low wages at clothing factories, and often rely on subsistence farming to put food on the table. 80% of children live with single parents. The current school has been there for 10 years and resembles a village of tents and shed-like structures. 108 students attend the school. 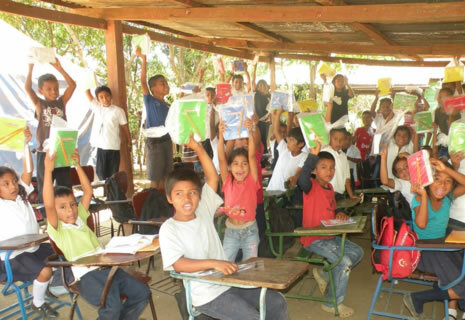 Land for the new school has been donated to the Nicaraguan Ministry of Education. The land is big enough to accomodate classrooms and a sports area for children to play. A new school will attract other children in the community that have previously stayed home because of the poor conditions. The new school will give the children a safe place to recieve classes and play. We can make a difference! The entire Jardines de Apoyo community knows that the current school is not suitable and they eagerly await a new school for students to learn and play.